Bart de Zwart has won the 2016 Yukon River Quest, paddling for almost three whole days with very little rest to become the first ever stand up paddle champion of this epic race. Here are the finishing times after an extraordinary 715km of paddling through the Canadian wilderness. However this “race” isn’t about your finishing time or your placing, it’s simply a race against yourself. Just standing on the start line requires a good dose of bravery, while finishing this epic course is a monumental achievement. And let’s not forget about the two other pioneers (this is the first year stand up paddlers have been allowed to compete at the Yukon River Quest): Tony Bain, who withdrew around the 300km mark, and Joanne Hamilton-Vale, who was heartbreakingly forced to retire on day 1 when she became extremely ill after drinking river water. After more than 24 hours of non-stop paddling, Bart de Zwart has just reached the halfway point in the 715km (444 mile) Yukon River Quest, a truly epic paddle race that’s happening in the Canadian wilderness this week. The Yukon River Quest, the world’s longest annual paddle race, is an infamous challenge in the world of canoe and kayak. 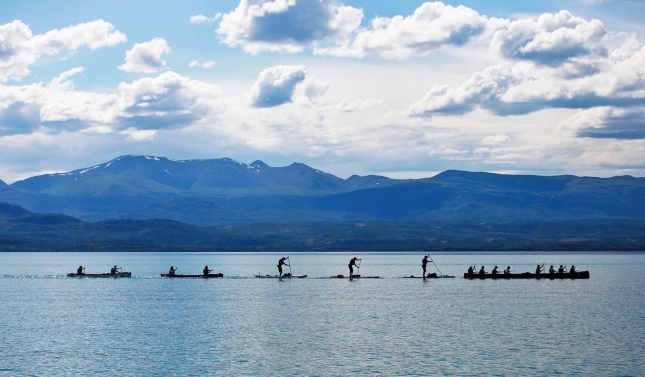 However this is the first time stand up paddlers have been allowed to compete in what is known as the “Race to the Midnight Sun”, so these 11 paddlers truly are pushing our sport to new frontiers. It’s downright inspiring. Bart made it to the mandatory rest point at Carmacks (which is actually not even quite halfway) about an hour ago. Right now he’ll be stretching, eating, hydrating, and preparing for a quick sleep before getting back out on the water. Bart hit the rest stop in the lead SUP group along with noted paddle explorer Norm Hann and local expert Stephen Waterreus. Incredibly, they’re less than 4 hours behind the race leaders — a two-man canoe team. Apparently many locals thought the stand up paddlers were crazy for even attempting this mammoth voyage, but so far they’re proving everyone wrong. Of the other pioneering stand up paddlers: Jason Bennett was only 10 minutes behind, Lina Augaitis and Andre Le Geyt are about an hour away from the rest stop, while Stuart Knaack, Glen Pearson, Michelle Eshpeter and Tony Bain are still making their way along the river. Joanne Hamilton-Vale has withdrawn — trying to find out what happened but Jo is one of the toughest paddlers on the planet so hopefully nothing serious. After getting some much needed sleep, Bart de Zwart, Norm Hann and Stephen Waterreus left the mandatory rest spot at the town of Carmacks at 1937 local time, or about 20 minutes ago. They departed exactly 7 hours after they arrived (7 hours was the mandatory minimum resting time). Jason Bennett departed 10 minutes later. Lina Augaitis and Andre Le Geyt have 2 and 2.5 hours of remaining rest time respectively, while Stuart Knaack and Glen Pearson only arrived at the rest point an hour ago. Michelle Eshpeter, who has been paddling for an incredible 32 hours non-stop already (unless she took an unscheduled break, which I don’t think she did), will arrive at Carmacks in about 20 minutes. Here’s a clip of Bart, Norm and Stephen departing Carmacks. This also gives you a good idea of the strong downstream current that makes it possible for these guys to paddle at an average speed of 15km/h. Sounds like Joanne Hamilton-Vale became extremely sick after drinking the river water and was forced to withdraw. She was unable to hold down any food or water for the next six hours, and race officials forced her to retire after seeing she was in no shape to safely continue paddling through the remote wilderness (it would have been another 5 hours to the next safety checkpoint). Jo is one of the toughest paddlers on the planet, so she must have been in rough shape if she was unable to continue. Her post on Facebook spoke about being devastated at having “failed” to finish (though she’s clearly anything but a failure), with the tenacious Englishwoman summing it all up by saying: It was honestly the hardest decision I have ever made and the most difficult words to say were “I officially quit from the race”. Edit: I just spoke with Jo on Facebook and she’s gutted. However in her true fighting spirit, Jo has already turned her focus to the MR340, the 340 mile (547km) race in Missouri starting July 18. Bart will also be attempting the MR340 next month. Just received update that Tony Bain withdrew from the race this afternoon at the Little Salmon checkpoint, which is about 3 hours before the Carmacks halfway rest stop. Not sure if it was due to exhaustion or if something went wrong, however Tony paddled 28 hours non-stop so it’s an amazing effort either way. So far there have been 15 withdrawals across the various divisions (canoe, kayak, SUP). It’s now 6am Friday morning in the Yukon, meaning paddlers have been out there for 42 hours (including the 7 hour mandatory rest stop). The finish-line cut-off time is exactly double that – 84 hours – but it looks like everyone is safely beyond the halfway mark already, so hopefully nobody misses the required checkpoint times further down the river. Based on the GPS map, it looks like Bart de Zwart (@bartdezwart) and Norm Hann (@normhann) are the only two left in the lead pack, with Stephen Waterreus dropping back by about 20 minutes. Jason Bennett (@bennett.jason) looks like he’s moved up into third, only about 10 minutes behind Bart and Norm (and closing the gap). Lina Augaitis (@linaaugaitis) is 3 hours off the pace of the leaders, while Andre’ Le Geyt (who’s paddling an inflatable no less) is another 45 minutes further back. It’s been a rather unique race from Lina, who has had to pump breast milk while paddling in order to feed her infant child at some of the checkpoints without having to stop. The three other paddlers – Stuart Knaack (@supyukon), Glen Pearson and Michelle Eshpeter (@miss_me_wellness) – are all back on the water after their mandatory 7 hour break at Carmacks. To put this extraordinary challenge into perspective: The back-markers are on track to finish around 8pm on Saturday evening. That would be 80 hours after they started at lunchtime on Wednesday… The cut-off is midnight Saturday night (84 hours). It looks like there’s a second mandatory rest stop approaching at the “Coffee Creek” checkpoint, where I believe paddlers have to stop for at least 3 hours. The race leaders are Tim and Pat Turner in the ‘Cache Flash’ two-man canoe, followed 10 minutes behind by the two-man canoe of Jeff Brainard and Gaetan Plourde aka ‘Perfect Storm’ on the GPS tracker. They’ve just reached the 3 hour rest stop at Coffee Creek. Bart and Norm passed the “Fort Selkirk” checkpoint (the final marker before Coffee Creek) at 0445, or almost two hours ago. It’s a mammoth 7 hour paddle between Fort Selkirk and Coffee Creek, with the GPS timer estimating the lead stand up paddlers will reach the break at exactly 12 noon on Friday, or exactly 5.5 hours from now. It also looks as though Jason Bennett is only a few hundred metres behind Norm and Bart. Based on last year’s times, when the winning two-man canoe team took 18 hours between Fort Selkirk and the finish line, right now I’d say the lead stand up paddlers have about 20 hours of paddling plus the 3 hour rest stop in front of them. Or in other words: There’s still almost another full day of this race to go. We’ll keep updating this post as the race progresses, so check back later for more info (follow the official Facebook page for more updates in the meantime). JEP Media also has some great shots (and a few videos) up on Facebook. It’s exactly 2 days since this mammoth race began, and there’s still more than 24 hours to go for the paddlers in the back half of the field. Norm, Bart and Jason are about 35 minutes away from the Coffee Creek checkpoint, where they’ll enjoy a mandatory 3 hour rest stop. Stephen Waterreus, who was in the lead pack with Norm and Bart yesterday but faded after Camaracks, is still holding a good pace about an hour behind the leaders. Lina Augaitis is just under 4 hours behind the leaders, with the inflatable warrior from the isle of Jersey, Andre Le Geyt, only a kilometre or so behind her. Stuart Knaack, Glen Pearson and Michelle Eshpeter still winding their way along the almighty Yukon River, with Stuart and Glen expected to hit the Coffee Creek rest stop around 11pm, and Michelle on track to arrive just after midnight. Oh and it’s also Canada Day today. Quite fitting. The overall race leaders, the two-man canoe team of Jeff Brainard and Gaetan Plourde (aka Perfect Storm), are scheduled to pass by the final checkpoint of “Sixty Mile River” just before 1600 (4pm Friday afternoon). Perfect Storm raced last year as well (finishing runner-up) so they can provide a good estimation of finishing times. Last year Jeff and Gaetan took 4 hours 23 minutes to complete the final leg from Sixty Mile River to the finish line at Dawson. So if they hit the checkpoint at 1600, they should cross the finish line just before 8:30pm Friday evening. What does that mean for the stand up paddlers? Bart, Norm and Jason hit the Coffee Creek about 10 minutes ago, 7.5 hours after Perfect Storm. If that gap keeps growing – let’s assume it’ll be around 9 hours by the finish line – the first stand up paddler should finish at approximately 0530 Saturday. That’ll be just under 66 hours, or nearly three days, since they left Whitehorse at lunchtime on Wednesday. But don’t worry about paddling the final few hours in the dark: The sun will set in Dawson tonight (or rather: tomorrow) at 12:43am, before quickly rising again at 4:01am. It’ll never get truly dark, with the sun only dipping below the horizon. They do call this the “Race To The Midnight Sun” after all. Here’s Stuart Knaack aka @supyukon (standing) and Glen Pearson at around 1130 Friday morning. 11:30 am, we just walked out of our tents after a little rest to set up on the banks at Minto…..and there were these 2!! Making faster time than we Anticipated!! All smiles. Beauty day for a paddle. We are off to meet them at the finish line in Dawson. The race clock has just ticked past 50 hours, however the finishing times will deduct the 10 hours of mandatory rest stops (7 hours at Camaracks and 3 at Coffee Creek), meaning the winning times for the two-man canoe teams will be around 46 hours, and for the top stand up paddlers probably around 55 hours. I’m still predicting the race leaders (the two-man canoe team) will finish around 8:15pm on Friday evening, and that the lead stand up paddlers will cross the line at Dawson around 5:30am on Saturday. According to the GPS times, Norm Hann, Bart de Zwart and Jason Bennett hit the Coffee Creek rest spot at 1253 local time, around 20 minutes ahead of Stephen Waterreus. The top four guys have stayed virtually dead even for two whole days now, so it’ll be interesting to watch the GPS tracker over the final few hours tomorrow as the paddlers get closer and closer to Dawson. Who will make a break and go for the race win? And at exactly what point of a 715km race is it the right time to break away?! Speaking of Dawson, here’s some random trivia for you: The town was founded during the “Klondike Gold Rush” in 1896-99, becoming the centre of the infamous stampede. From a population of 500 in 1896, Dawson exploded to house some 30,000 people by the summer of 1898. A year later the boom had ended and most of the prospectors had moved on. The population today is a humble 1,319. If you’ve ever watched the classic HBO show “Deadwood” then I imagine it was something like that. Norm Hann, Bart de Zwart and Jason Bennett have just departed from Coffee Creek following their mandatory 3 hour rest stop. Stephen Waterreus will depart about 20 minutes after them. They are now on the final stretch home, with “only” about 165kms (100 miles) until the finish line in Dawson. If all goes according to plan, the first stand up paddler will cross the line in just over 13 hours. I’m predicting the winning two-man canoe team will claim line honours in about 46 hours (56 hours total minus the 10 hours of mandatory rest stops), while the lead SUP competitors will cross the line in a time of roughly 55 hours. Further back in the field: Lina Augaitis is about an hour outside Coffee Creek, meaning she’s about 4 hours behind the leaders. Andre Le Geyt is another hour further adrift. Stuart Knaack and Glen Pearson are about 7 hours behind Andre, or 12 hours behind Bart’s group, with Michelle Eshpeter still fighting strong another hour and a half behind them. Michelle is on track to finish around 8pm Saturday night, which would be 80 hours after she started (70 hours of paddling + 10 hours of mandatory breaks). That’s safely within the finishing cut-off time of midnight (84 hours), and is an absolutely incredible effort in this the first year stand up paddlers have been allowed to compete. So far we’ve had 16 teams withdraw from the race across the various divisions (canoe, kayak and SUP; one-person, two-person, four-person and eight-person teams). There were 93 teams on the start line (solo paddlers are counted as one-person “teams”). Right now the lead stand up paddlers are in equal 24th position overall, which is incredibly impressive. I have no doubt the SUP community will be invited back to compete again next year after the pioneering success of this year’s trial run. The first team has just crossed the line, with the two-man canoe of Jeff Brainard and Gaetan Plourde (aka “Perfect Storm”) taking line honours. These guys were overall runners-up last year (though they were still first in their division – a two0man kayak team took line honours in 2015), but have gone one better this year. Congratulations to Jeff and Gaetan — the race clock was 56 hours, 14 minutes and 56 seconds when they crossed the line, which means a race time of 46:14:56 (taking away the 10 hours of mandatory rest stops). The lead stand up paddlers are on track to finish in about 8 or 9 hours. It’s now 1am Saturday morning. With the race clock having ticked past 60 hours, and the midnight sun setting at the finish line in Dawson only 15 minutes ago, the lead trio seems to be breaking up, with Bart de Zwart perhaps making a move to go for the win. Right now Bart has a lead of probably 300 metres over Norm and Jason. Stephen Waterreus is still setting a great pace just a few kilometres behind the lead group. More and more canoe and kayak teams are crossing, and the excellent YRQ media team is posting the finish line photos on Facebook. Bart de Zwart looks set to become the first ever Yukon River Quest stand up paddle champion (remember this is the first time SUPs have ever been allowed to compete; it’s a “trial run” this year and if all goes well, more stand up athletes will be allowed to compete in the future). Bart has a ~15 minute lead over Norm Hann and Jason Bennett. He only has 6 or 7kms to the finish line in Dawson, with the GPS estimating Bart will cross at 4:32am local time. The sun will rise at 4:01am, so it will be a lovely early morning arrival into Dawson. Last night we were thinking the first stand up paddlers wouldn’t hit until the finish til after 5am, so they’ve set a great pace over the final hours. Either that or stream has picked up — the Yukon runs at an average of 5km/h but is faster and slower in certain sections. Either way it’s been an extraordinary effort so far, and the guys are now within five kms of the finish. Nearly three whole days since this race began, and after almost 55 hours of paddling time, Bart de Zwart is taking his final strokes towards the finish line where he will claim victory in the 2016 Yukon River Quest. Bart will be able to see the finish line around 1km away right now, with Jason and Norm approximately 2.5kms behind. The cutoff time for finishing is 2359, so everybody looks safe. And let’s not forget Joanne Hamilton-Vale, who had to retire due to extreme sickness (see update #3) and Tony Bain (update #4) who retired at around the 300km mark. Those two were part of this historic and pioneering race as well, and both deserve a huge congratulations for just being on the start line. Although they both desperately wanted to finish the race, sometimes mother nature has other ideas. Bart crossed the line moments ago to become the first ever SUP champion of the Yukon River Quest. 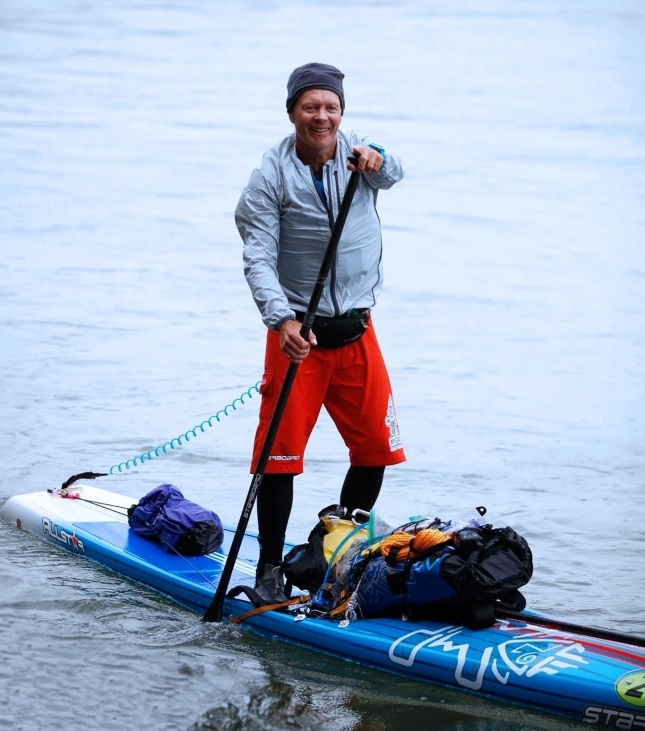 The famed SUP adventurer crossed the finish as the race clock ticked over 54:41:14, which gives him an official race time of 44 hours 41 minutes and 14 seconds after the 10 hours of mandatory rest stops are taken out. Norm Hann and Jason Bennett appear to be within 1km of the finish line and are estimated to finish in around 10 minutes. Congratulations Bart de Zwart. What an extraordinary performance. More than two and a half days since the race began back in Whitehorse, 715km or 444 miles upstream. And congratulations to every stand up paddler that was part of this race. We’ll try and round up some finish line photos for you asap. Congratulations to Norm Hann and Jason Bennett, who have just crossed the line – 65 hours after the race began. Their official race time is a couple of minutes shy of 55 hours (the 10 hours of mandatory rest stops is removed from the overall time). They cross just 15 minutes behind race winner Bart de Zwart, which is an incredible achievement. Norm is the official runner-up in a time of 54:56:47, while Jason is third in 54:56:58. Stephen Waterreus is expected to cross in about half 25 minutes. Bart was actually the 26th team to cross the line out of a field of 93 (Norm and Jason are 30th and 31st respectively). That’s quite incredible considering stand up paddlers are on the slowest craft — most teams are solo, two-person or four-person canoes or kayaks. There’s even a handful of eight-person “voyageur” canoes in the race. Out of the 93 starters there have been 16 retirements. Many locals were skeptical of the SUP athletes, thinking they probably wouldn’t make it. But not only have they made it, they’ve out-paddled more than two thirds of the field. Hopefully this means SUP will become a permanent division after this year’s trial run, because I know I’m not the only one who’s been totally inspired to do this race one day after following the progress of Bart, Norm, Jason and the other 8 pioneering stand up paddlers. Stephen Waterreus is about to cross the line for an incredible 4th place finish. Stephen was up with Bart and Norm in the lead group until the 350km mark at Carmacks, but even though he was dropped in the second half of the race, he’s tracked along at a similar pace to the leaders for the past 36 hours, finishing just 50 minutes behind Bart. Also looks like Glen Pearson and Stuart Knaack who have been paddling side by side almost the entire race, took a couple of hours extra rest at the Coffee Creek break, perhaps getting some much needed sleep. The break was a mandatory minimum of 3 hours, however it looks like the guys were there for about 5 or 6 hours. Glen and Stuart are back on the water and right now they’re about 3km behind Michelle Eshpeter, who was behind them before the stop. So we can expect all three of them to reach the finish some time around 7-8pm Saturday evening. And to give you an idea of what the finish line in Dawson looks like, here’s a clip of Team Perfect Storm taking line honours at 8pm Friday evening. We’ll try and round up some shots of the stand up paddlers crossing the line (you can see some of the earlier finish line photos on the official Facebook page). Congratulations to Stephen Waterreus, who crossed 4th in an official time of 55:36:55. We’ll try and get some words (and photos) from the top stand up paddlers, but otherwise there won’t be much happening for the next few hours, so we’ll hold the updates for now. Here are the estimated finishing times for the remainder of the SUP division. As soon as I wrote that last update I spotted some pics on Facebook. Big thanks to Carmen Merkel, who’s been following her partner Jason Bennett along with the other two leaders Norm and Bart, for capturing the moment Bart crossed the line after 54 hours 41 minutes of paddling. Bart reached the finish in the town of Dawson just before 5am Saturday morning. Because we’ve got a few hours until the next stand up paddler (most likely Lina Augaitis) reaches the finish, let’s take a look at some of the numbers behind this race. Bart crossed the line 64 hours and 41 minutes after the race began. Taking out the 10 hours of mandatory rest stops (7 hours at Carmacks and 3 hours at Coffee Creek), his official race time is 54:41:14. The Yukon River Quest course is 715km, which gives Bart an average paddling speed of 13.07km/h across the entire race. Competitors are racing downstream, and the Yukon River flows around 5km/h on average. So if you take that into account then Bart was paddling at an average of roughly 8km/h, which makes more sense. For some context, Bart usually averages around 9.5km/h in the 11 City Tour (which is 5 hours of paddling per day for 5 days straight), so 8km/h over three days of almost non-stop paddling would appear to make sense. Bart was paddling the 14×25 Starboard All Star, though remember it was weighted with a lot of food/water/gear. When I get a chance to speak with Bart later I’ll ask him if he has a more accurate reading, but right now I’m going to unofficially say it’s 13km/h average speed with an 8km/h paddling average. Lina Augaitis crossed the line moments ago, becoming the first woman to ever finish the Yukon River Quest. Lina reached Dawson just after 10am local time Saturday morning, roughly 70 hours or almost three full days since departing Whitehorse on Wednesday. Her race time is officially 60:22:08 after the 10 hours of mandatory rest is subtracted. Anybody that finishes this race deserves a huge round of applause, but Lina sure did it the hard way. The Canadian gave birth to her first child six months ago and is still breastfeeding, which is exactly what she did at the rest stops. Lina even used a breast pump while paddling so that she wouldn’t have to stop for too long at some of the intermediate checkpoints. What an extraordinary effort of both motherhood and athleticism (and of course huge credit has to go to Lina’s husband who did so much work off the water). There are now four stand up paddlers still out on the river, with the next competitor, Andre Le Geyt from the isle of Jersey, expected in 1 hour 45 minutes, or just after 12 noon local time on Saturday. Glen Pearson, Stuart Knaack and Michelle Eshpeter will probably arrive just after 7pm Saturday evening. Andre Le Geyt has just crossed the line as the 6th stand up paddler, recording an official time of 62 hours 59 minutes, after the 10 hours of mandatory rest stops (7 at Carmacks and 3 at Coffee Creek) are subtracted from the overall race clock. Andre represents the British isle of Jersey, and is a veteran of the classic 11 City Tour in the Netherlands. As if finishing this race wasn’t impressive enough already, Andre completed the 715km voyage on an inflatable (a 14′ race board from Red Paddle Co). Congratulations to Andre and to everyone else that has been part of this race. What a feeling it must be to cross that finish line three days after the race started. The road on the other side of the river at the finishing town of Dawson is called the “Top of the World Highway” — seems quite appropriate. Michelle, Glen and Stuart are still out on the river. Michelle has just passed the final checkpoint at Sixty Mile River, so she now has an official finishing estimate — right on 1900 local time, or exactly 6 hours from now. Glen and Stuart are on track to finish about 20 minutes after Michelle. We’ve got three more pioneering stand up paddlers making their way towards the finish line in Dawson: Michelle Eshpeter, Glen Pearson and Stuart Knaack are all on the home stretch. It’s been an amazing effort from these three, who have now been out there for more than three whole days. Judging by the movements on the GPS tracking map, it looks like Stuart and Glen have slowed right down. I suspect they’re chaperoning home the final competitor on the course, a one-man kayaker, which would be mighty noble of them (though who knows, could be the other way round!). Michelle seems to be going strong and is on track to finish around 7pm Saturday night – 5 hours from now – while Glen and Stuart should cross about an hour later. The cut-off time is midnight Saturday night, so everybody is going to finish no problems. Until then follow the GPS tracking map (click the ‘SUP’ tab to see estimated finishing times) and official Facebook page to cheer home the final paddlers on this epic adventure. “Feeling pretty good right now. What a race. This is the toughest race I’ve ever done. Also very remote and beautiful. Some really good long distance paddlers here in this race, especially Norm and Jason – they trained hard. We stayed together for the first 40 hrs because you don’t want to do this race totally by yourself and plus we all had very similar speed in the long run. I felt that maybe I had some extra in reserve but it was definitely 55 hours of hard tough paddling. Because the river is so big you often have options where you can go left or right. And if you go the wrong way there are huge consequences. I made 2 mistakes: The first one I lost only a little time but the second one I lost a lot of time, about 20-30 minutes. Luckily I had built up enough of a lead that it didn’t cost me the race. The final three stand up paddlers – Michelle Eshpeter, Stuart Knaack and Glen Pearson – triumphantly crossed the line moments ago, reaching Dawson approximately 3 days and 7 hours after they departed from Whitehorse. With the mandatory minimum of 10 hours rest taken off the clock, their official race times are just over 69 hours (Glen and Stuart actually took an extra hour or two at the second rest stop, but that gets included in their race time as it wasn’t mandatory). Congratulations to all three for completing this monumental journey. What an amazing effort. They will each go down in the history books of SUP as some of the first ever paddlers to conquer the Yukon River Quest standing up. Pioneers. The last competitor on the course, a one-man kayak team, is about to cross the line as well, which officially completes the 2016 edition of this mammoth race. The 93 teams on the start line was a record for this event, and with 16 retirements along the river that means 77 teams finished the race. There was everything from stand up paddle boards, canoes, kayaks, one-person teams, two-person teams, four-person teams, even some eight-person ‘voyageur’ canoe teams. What an incredible race in a breathtakingly-beautiful part of the world. Definitely a bucket list event to consider (though you might want to start training). Anyway I think it’s safe to say the first ever Yukon River Quest SUP division has been a huge success. Hopefully the organisers agree and this paves the way for more stand up paddlers in the future. Huge round of applause goes to the 11 pioneering paddlers that entered the experimental SUP division this year and showed the wider paddling world what’s possible. So, now then, who’s up for a 715km paddle through the Canadian wilderness in about 12 months’ time? Where were they paddling? Check out the GPS tracker for a detailed map and the official finishing times for all competitors. Also catch up on the backstory to this race with our Yukon River Quest preview, which has some inspiring words from the paddlers and a bit of more background on this epic event. And make sure you follow the official Facebook page for more updates and photos – a few of which I’ve included below.